Army And Air Force Exchange Service Recommends TV Sports, Not 'Divisive' News The Army and Air Force Exchange Service initially recommended that facilities feature sports programming. An updated memo tells facilities to make adjustments based on "the news of the day." 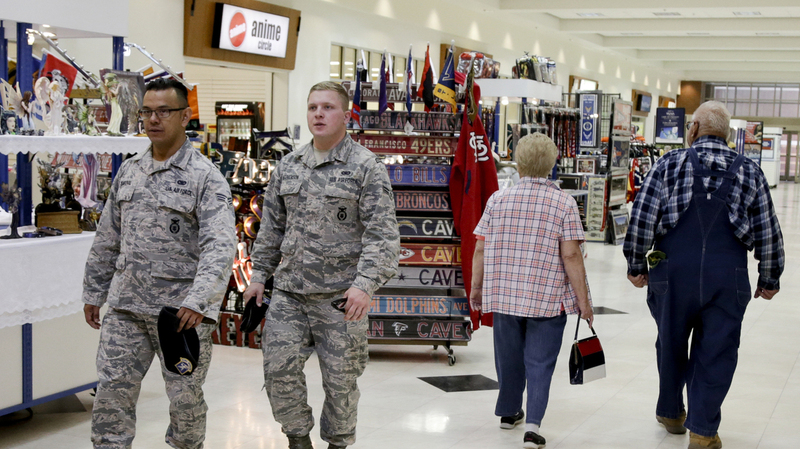 Service members and civilians walk through a store on Offutt Air Force Base in Nebraska in 2017. The Army and Air Force Exchange Service, which oversees military retail facilities, recommended this week that stores show sports instead of news on their common-area televisions. Instead, the Defense Department agency suggested that stores feature something less controversial: sports. "The Exchange has elected to play sports channels/sports programming on all common area TVs," the message stated. Chris Ward, AAFES' senior public affairs manager, tells NPR that the memo was not a policy change but "general guidance" for the stores. "We've gotten comments from customers, 'Why is this TV on Fox?' 'Why is this TV on CNN?' You're never going to appeal to everyone," Ward says. AAFES issued similar guidance in the past, he adds, and "it's not just the political climate we're in now." That message includes leeway for facilities to make adjustments "based on the news of the day and local needs," he says. Chavez, 40, describes being conflicted on AAFES' guidance. He says that news programming in AAFES facilities "should be blocked because regardless of your political affiliation, you still have to have an allegiance to your president." But he is also concerned about denying people information. "It shouldn't be blocked because it could be viewed as a form of censorship," Chavez says. Over a meal at U.S. Army Garrison Yongsan in South Korea, Pfc. Tyler White told Stars and Stripes, "I just think politics should stay out of the work environment." Another soldier, Staff Sgt. Manuel Cardona, told the military newspaper that he disagreed with AAFES decision. The broadcasts were "informative," and often his only way of catching up on the day's news.